Most simply put, Search Engine Optimization, or SEO for short, encompasses a wide variety of optimization techniques to help make your website search engine friendly, resulting in higher search engine rankings, more traffic to your site, and ultimately more customers for your business. These techniques start with keyword research, or the process of identifying keywords for your niche that describe your business and will drive search traffic to your site. 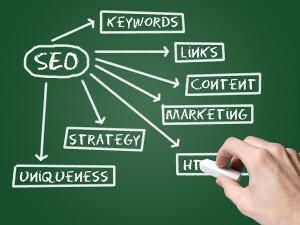 Following the research, monthly SEO includes on site optimization, which consists of making changes to website content and coding to represent the keywords your website is trying to rank for, as well as off site optimization, which consists of building a wide variety of links to your website to tell search engines your website is important. And lastly, SEO also involves constant evaluation and analysis of the effectiveness of an SEO campaign to monitor changes in traffic, rankings, and evaluate keyword selection. Think back to the last time you were looking for a new product, a new service, had a question about something, wanted to find a review for a company– chances are you are just like the other 81% of people who begin their search using a search engine. In fact, it is estimated that worldwide well over half a billion searches are performed each and every single day! Clearly there are people in every single niche utilizing search engines to find new products and services everyday, but is your company ranking to take advantage of this traffic? Search engines are an extremely competitive place-with only 10 websites appearing on the first page for any given search term. Did you know that over 90% of searchers never leave the first page of search results? Being ranking anywhere except page one is clearly unacceptable. Simple SEO Group has developed a simple, budget friendly strategy that is extremely effective in moving your company’s website into the search engine spotlight. No! The largest misconception out there is that all SEO services are the same and provide the same type of work and same results. The problem is there’s no easy way to know what you’re getting — I’ve seen SEO providers priced at $100 per month and $10,000 per month both do very low quality work. How Long Will It Take To See Results? SEO is a medium to long term business strategy, be leery of SEO providers who will take far too long or too little time as they aren’t doing quality work or aren’t doing enough work. We provide our clients with access to our proprietary rank tracker to allow them to check in whenever they’d like and see results happen week by week. What Is Your Approach To Link Building? Be careful of the types of links. Google specifically says websites using certain SEO strategies are violating their terms and could be removed from search engines. Make sure your provider is building quality links through unique content and adding value to the internet, otherwise you could find your website falling out of search results completely. Can You Provide Case Studies And Testimonials? Make sure it isn’t a fly by night provider or low quality provider. We always provide testimonials and case studies right on our website, and have additional testimonials, references, and case studies available upon request. How Do You Report? Make sure they are accountable and deliver reports. We deliver monthly traffic improvement reports and also give you access to our client portal to view your ranks and notes from your account manager. We’re also available by email 24/7/365 and available by phone during normal business hours (Monday-Friday). Do You Guarantee Rankings? No one can guarantee rankings. We’ve never had a client not rank, but at the same time it is possible that you might not get rankings. Be leery of anyone who promises 100% rankings. Any marketing activity, whether it’s SEO, PPC, TV ads, flyers, coupons, or anything else has a risk of not delivering a high ROI. What Are Your Fees/Costs? Be careful of hidden fees, costs, and contracts. We never lock you into a contract and never have any hidden or additional fees/costs. We believe in “what you see is what you get” and are very upfront with our entire SEO process, services, costs, and terms.